The breed's development began in the late 1920's, with the native Landrace type, which was described as "a short, fat and poorly muscled pig."' In the early 1930's, the German Landrace was introduced and crossed with the native stock. The German stock that was introduced was said to have had an infusion of British Large White. Following World War II, Dutch Landrace were imported and used. These were said to have carried recent introductions of Danish pig "blood". The selection and genetic improvement program that followed resulted in a breed that had fairly good fertility, strong constitutions and more satisfactory rates of growth and feed conversion. The great emphasis in Belgium swine production has been to produce a very high quality of fresh meat. Most pork in Belgium is marketed as fresh pork rather than as cured or processed meats as is true in so many pork consuming countries. This has led Belgium to the production of a higher percentage of lean in their swine, a lean of very high quality and a minimum of fat cover that doesn't sacrifice fertility in the breeding pen or economy of gain on the feeding floor. There is extensive testing to aid in reaching these objectives, with eight stations testing over 5,000 pigs per year to isolate those strains capable of further improvement. The breed, which is often referred to as the "butcher's pig," has evolved in the last half century. The Belgian Landrace is a muscular white breed with heavy drooping ears. They are not as extreme in length and other physical characteristics as some other Landrace strains. They may be described as a very practical type that are sound in feet and legs, have good fertility, are good mothers and milk well until early weaning. The common practice in Belgium is to wean pigs at about three weeks of age. The breed has been especially selected for good performance in confinement. Commercial production in Belgium often uses the Belgian Landrace sow and the Pietrain boar to produce crossbreds for market. The latter is said to add quality. 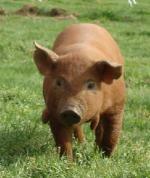 The crossbred sows are then often bred back to Belgian Landrace boars. The Belgian Landrace is an excellent example of a breed that has been selected to meet the demands of a specialized environment and market. It should come as no surprise that a distinct type developed with a reputation for producing top quality fresh pork. 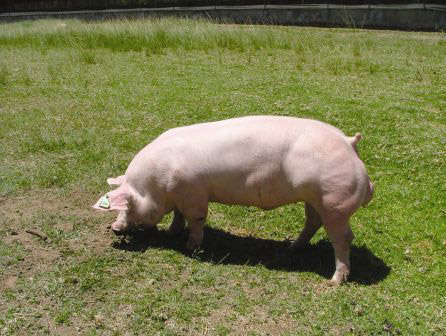 The breed has earned the right to command interest in other countries which have similar objectives in swine production.